Simply put, four days can transform your whole high school experience. Those four days are the days that make up the DECA state competition. High schoolers from around the state come together, unified by a common passion: business. Anyone here can pursue their interests whether it’s in hospitality, financing, marketing, or business law. For four days, students get to meet new people, broaden their networks, have fun, and, most importantly, learn more about the topic that excites them. The process to reach states starts at the regional level. DECA allows you to hone in on whatever specific interest you want, ranging from fashion merchandising and marketing to business law and ethics. After you pick a category, you take a cluster test, which is a general test for that specific interest. For example, fashion merchandising and marketing and marketing management decision making would take the same marketing cluster test. In order to make it to the state level, one must succeed at the regional level first. Suffolk County has its own regional competition in which we participate. For a majority of categories, students must take a multiple choice test. The participants with the top 15 test scores for each of those categories move on to the state level. At the state level, participants take a test similar to the one at regionals and also perform role plays. One example of a role play that was given for marketing management was to play the role of directors of a photo editing company and negotiate with a hotel. These role plays are “real-world” situations that require students to use creativity and their business knowledge to devise a plan. These events range from creating a promotional plan for a new product to calculating a budget and planning a project to evaluating ethical concerns in a given situation. This year, states took place at the Rochester Convention Center in Rochester, NY. Those who attended from Hills East stayed at a hotel that was connected to the center, leaving participants fortunate enough to not be obligated to walk outside in the frigid weather. Memories were made every night over DECA dinners and pizza pies, as well as the interactive events like karaoke and trivia games. Between going to DECA workshops and practicing for their role play events, many stressed students could be found in the hallways doing homework together and catching up on what they might have missed in school. Despite this stress, it is totally worth the incredible experience and lasting memories. Many of our students won awards such as top ten in the test, top ten in the role play, and top ten overall. Every year, the Hills East DECA team leaves the state competition with a plethora of memories, awards, and new opportunities. 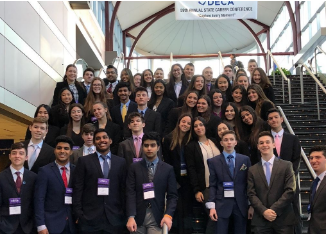 After our success at states, the Hills East DECA team is very excited to send 10 excelling students to the International Competition in Orlando, Florida!